The modern motorcycle evolved from a bicycle or velocipede fitted with a steam engine in 1867. Arguably, no other machine has influenced the global culture to the same historical significance in terms of iconic human impact. 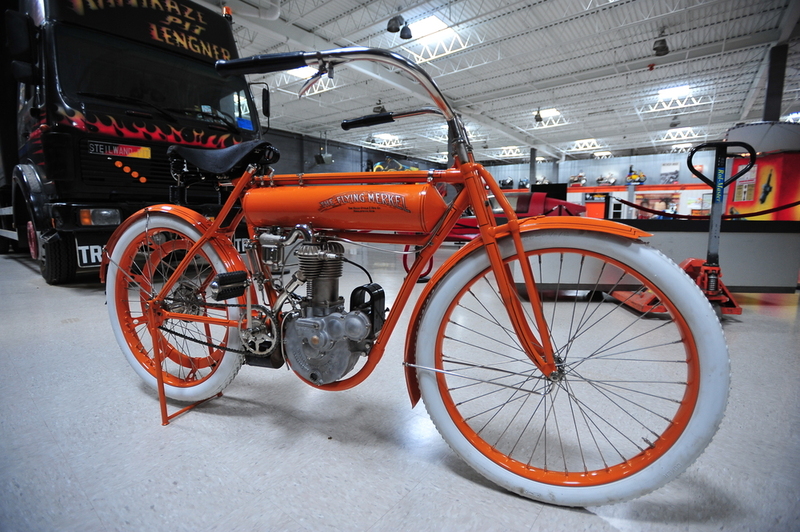 The mere mention of motorcycle conjures a vision of Harley-Davidson, started in 1903 or perhaps Indian, begun by bicycle racers in 1901, with a production run of three. However, the first motorcycle introduced into the United States was reportedly an import, carried to New York by a circus performer in 1895. 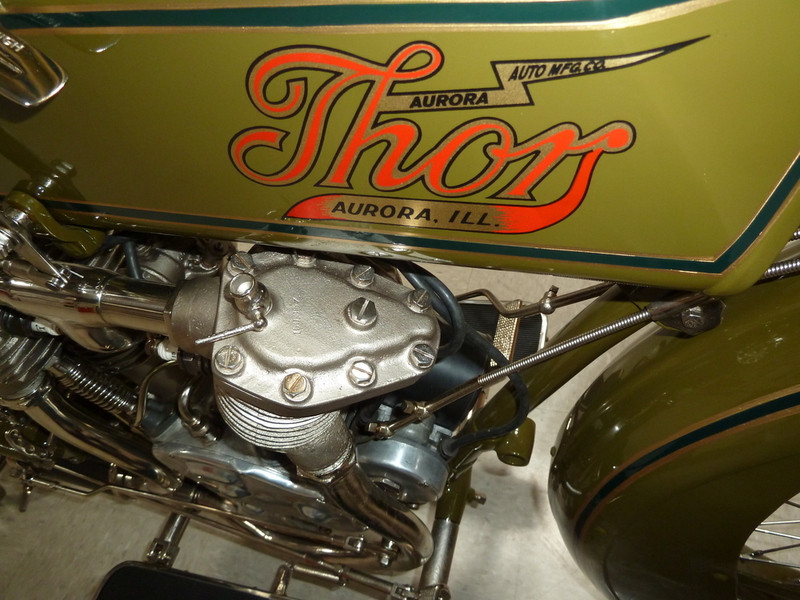 While motorcycle history is chronologically distinct with early development, a period prior to the Second World War and post-war thru modern eras, other segments demand attention. Perhaps counter-intuitively Motorcyclepdia exhibits early development machines downstairs with examples from Ace, Cleveland, Flying Merkel, Monarch, Orient, Pierce, Pope and Thor. Pure jewels of metal work, their engines defy gravity while supported with graceful frames. Ingenious single cylinder designs, logically extended double cylinder engines and masterful four cylinder examples which predate modern era production. Enter Motorcyclepedia and find the complete historical chronology of Indian Motorcyles from their 1901 replica thru 1953 models. Note the subtle yet significant technological developments with larger displacement engines, more horsepower, handlebar controls, and suspension improvements from leaf spring to shock absorber. Of special note are several glass enclosed Indian motorcycles which showcase their advancements in engine performance, such as the 4 valve per cylinder technical innovation. Mr. Gerald Doering has spent a lifetime in the acquisition and restoration of these unprecedented Indian machines, down to a complete diorama and extensive queue of rare sidecar models. On the other side of Motorcyclepedia is perhaps the most appropriate exhibition of culturally significant motorcycles in the museum. A full display of Kaizen (Japanese for change for the better) machines is available from the Antique Motorcycle Foundation, with models from Honda, Suzuki and Yamaha. Anyone in the least bit familiar with a motorcycle understands the impact of the Japanese on research and development in the late 1960’s and early 1970’s. Of note, pay attention to the RE or Rotary Engine model, the turbocharger equipped model and early Honda Gold Wing. Wooden, dirt track and hill climb competition incubated early motorcycle designs, as evident in the Flying Merkel examples. Note the machines with studded tires, ominously shaped fuel tanks and grab rails for bicyclists in track competition. No museum is complete without a display of the cultural impact the motorcycle infused into contemporary culture, from television to film. Mr. Ted Doering has compiled a few iconic examples of film; replicas of the free spirited cycles in the 1969 film Easy Rider, ranked number 84 by the American Film Institute in their greatest movie of all time compilation. Tucked away downstairs is the Lightcycle from the 2010 movie Tron: Legacy. Plus the iconic Triumph from the 1963 film The Great Escape rated 19 by the AFI in most heart pounding movies. Lastly, no exhibit of the motorcycle scene is complete without a nod to those creatively endowed masters of imagination; Arlen Ness and Ed Roth. Find their marvels at the entrance to the museum. Harley Davidson enthusiasts need to find the extensive display of chromed or polished v-twin engines from pan head to evo on wall to wall racks. Cutaway engines included. Friday – Sunday at 250 Lake Street in Newburgh, New York.